Scrum-half Williams won three caps for Wales between 1978 and 1981 with his international chances limited by the presence of first Gareth Edwards and then Terry Holmes. He also toured New Zealand with the British & Irish Lions in 1977, before he had been capped by Wales, and went on to feature in the first three Tests. 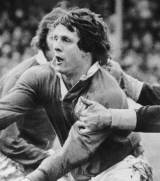 Williams made his Wales debut against Australia at Ballymore, Brisbane in June 1978 and scored a try on his debut. His only other international appearances came during the 1981 Five Nations Championship. He played his club rugby for Welsh sides Cardiff, where he also understudied Edwards, Newport and Swansea and he also played rugby league for Cardiff Blue Dragons towards the end of his career. Since retiring from playing rugby, Williams has continued to work in the sport and is currently an analyst for the 'Clwb Rygbi' programme on S4C and BBC Wales.